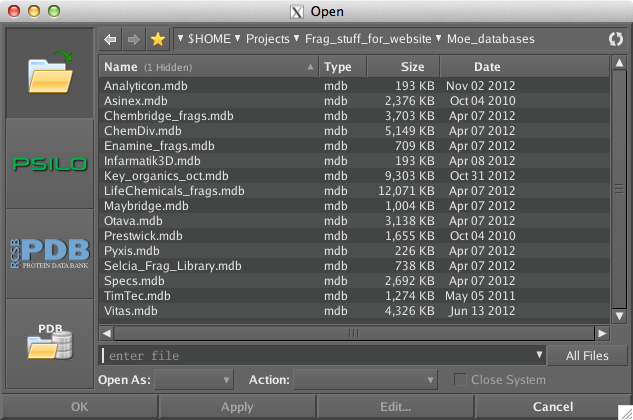 MOE 2012.10 was recently released and I’ve now found time to have a look at it. After installation a couple of things are immediately apparent, a MOE icon is available and MOE can now be launched from the Mac OS X Desktop and Dock. However the dock icon does not update to show that MOE is running normally in Mac OS X when an application is running, the Dock displays an illuminated dash beneath the application's icon. 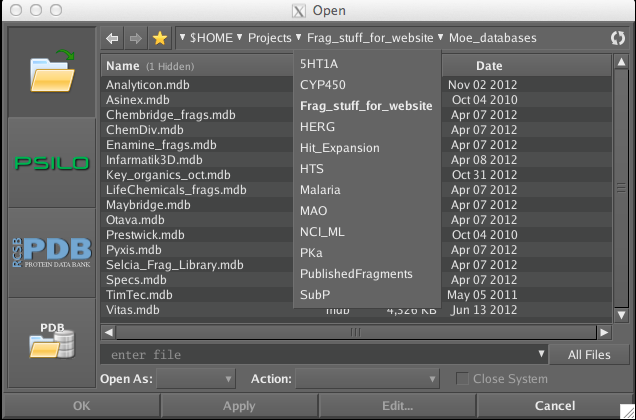 I found you could drop some files onto the dock icon and have them open, (PDB, mdb, moe) but not sdf, mol or SMILES. 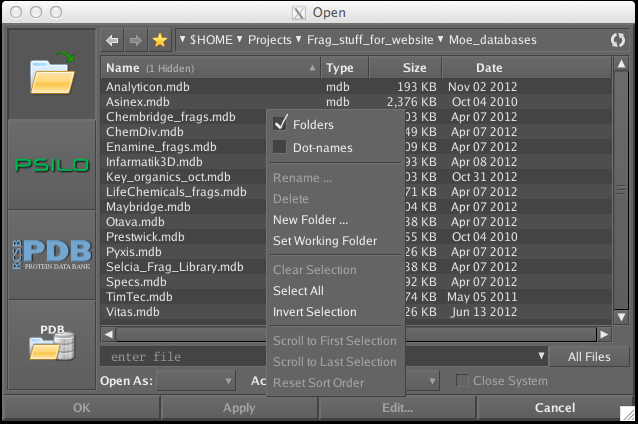 You can also double-click on a .moe or .mdb file and have it open in MOE. If you right-click on a ,sdf file and choose “Open with” and navigate to MOE the file can be imported into a MOE database but I could not see an option to simply open it into a MOE window. If you use multiple monitors then you will be delighted to see that new windows seem to open in the window in which the mouse resides. Support for copy/paste of MOE images on the Mac is now also available. The MOE interface has been updated and now has a mainly white text on a charcoal background, whilst these things are often just a matter of taste I must admit I find the new colour scheme easier to read. 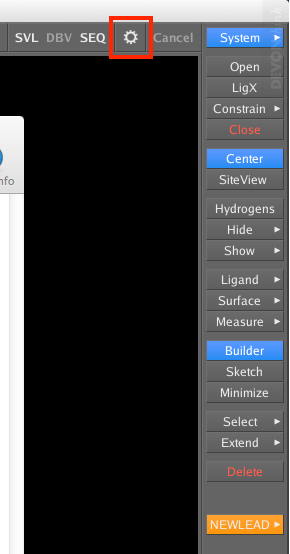 A new settings menu (highlighted in red below) in the MOE menu bar collects together configuration and customisation tools, including the option to return to the original lighter MOE_blanc scheme. Also in the top menu bar is DBV which lists open databases, very useful when a database gets hidden behind the main MOE window. The “Open” dialog box has been updated, with easy access to structures from PSILO or the RCSB or the non-redundant PDB database distributed with MOE, there is also a navigational history (forward and back buttons), a favourite directories menu (star), and the currently listed directory can be reloaded by pressing the refresh icon (rightmost in the path textfield). I also like the ability to navigate the directory hierarchy by clicking on the relevant part of the folder path as shown below. I’m already finding this an invaluable way to improve my workflow. The “Set Working Folder” has now gone, instead right-click within a folder and a drop down menu appears as shown below, with a variety of options, one of which is “Set Working Folder”.